The new map of the Milky Way. In the video below shows you the most detailed and complete picture of the Milky Way – a view from the Southern Hemisphere – never published so far. It is a mosaic obtained by merging the result of more than 700 observations of the APEX telescope, located in the Atacama Desert, in Chile. They appear with unprecedented clarity the star forming regions, the mysterious Galactic Center, and regions where dust and cold gas hovering at temperatures higher than a few fractions of a degree of absolute zero. 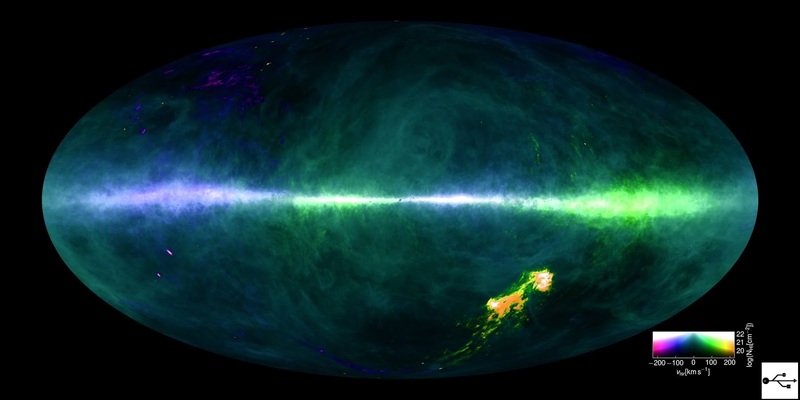 It is also the first time that the galaxy is retracted from the southern hemisphere to the wavelength submillimetre – the part of the electromagnetic spectrum between infrared and radio waves. By combining several images taken at different wavelengths can add additional levels of detail. In the image, the new data obtained from the telescope appear in red on a blue background made from a previous view of the galaxy taken by the European Space Agency’s Planck satellite. 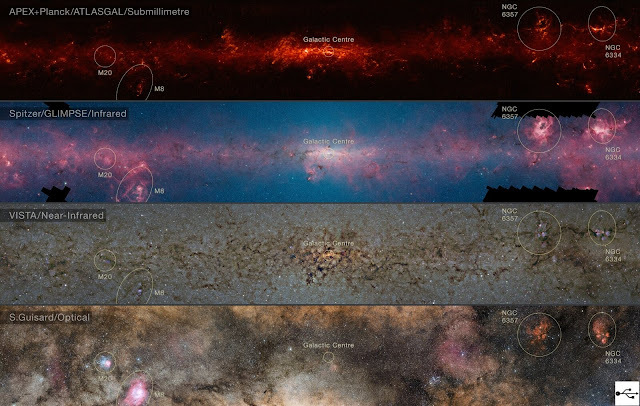 The central regions of the Milky Way in images taken at different wavelengths: from above, submillimeter radiation (captured by APEX); infrared; near infrared; visible light. The name “Milky Way” was given by the ancients to the whitish band that crosses diagonally across the celestial sphere, and then be extended to the entire galaxy. In fact, all the stars visible to the naked eye belong to the Milky Way. The European Southern Observatory, which is part of the APEX telescope, has published the new image to complete the project ATLASGAL, or Large Area Survey of the Galaxy, (large galaxy census): a name that reflects the size of the task, as that for the single image shown in the video we were required more than 400 hours of observations with the telescope over three years.